Just as every window in a home has some sort of frame holding the panels of glass in their place, so do your homes window screens. Although on rare occasion I have seen the creativity of the DIY homeowner find new ways to attach screens that I had previously never seen before including using staples, magnets, and even silicon as if it were never to be removed. A typical window screen install has its own integrally continuous frame that holds the fabric to itself using rubber spline material to keep it taut. In effort to blow your mind even more, there are actually a wide variety of frame types and sizes to accommodate the installation method required for each application, fabric type, or even the proper aesthetics of the window screens themselves. In this article I will review the most common types of window screen frames and their respective uses as well as touch on some less common frames that might be required for a more custom application. Until now, I have referred to all screen frames as one in the same by simply saying window screens. 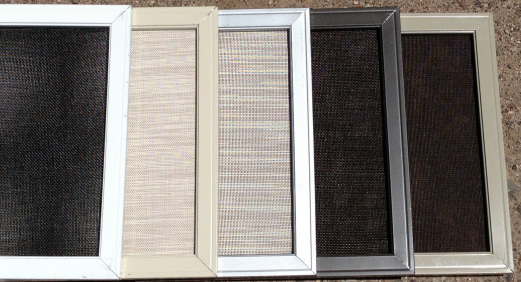 However, much of the decision in determining which frame type to use is actually in the window screen fabric itself. For example, it would not typically be smart to use a “Bug Screen” frame for the application of “Sun Screen Fabric” as it likely would not be strong enough to hold the much heavier and stronger fabric that requires being stretched much tighter to lay properly within the frame. Likewise, because most bug screens get inserted into a channel in the window frame, it usually doesn’t work to use the heavy duty solar screen frame as its size would not accommodate the size of the channel and simply would not fit. Your typical solar screen frame measures 1” x 7/16” whereas the standard bug screen factory replacement frame comes in at 3/4 “ x 5/16”. As stated earlier however, these are not the only sizes for each of these window screen types. There are many time s when installing window screens that the “Standard” just won’t work for the window application or the desired look. In these cases, there are custom size frames to meet most window screen needs. Here I will begin with the custom solar screen applications. The first of these situations are with what we call popout windows. Here in Phoenix, there are lots of tract homes, and it seems that about 50% of them use a window type where the fixed side of the window pops out beyond the rest of the window about 5/16”. The most common remedy for this is to mount separate “split” screens where one is mounted with clips to the fixed side, and the active side gets a slightly different frame that can be installed into the window frame channel just like the factory bug screen. This solar screen frame is 1” x 5/16” giving it a slightly thinner depth allowing it to slide into the channel. Bug screens are really where it gets most complicated as there are many more frame options to accommodate the fitment of hundreds of different window manufacturers. As mentioned earlier the standard frame is simply a 3/4 x 5/16” frame that is suitable for most insect screen replacements for most windows. There are however a variety of different sizes from 3/4 x 3/8 and 3/4 x 7/16”, and other more intricate types like the 5/16 and 1/2 lip frames for certain windows that do not have a small channel. Additionally we run across casement windows which are simply mounted inside the home to the window frame just like a sun screen would to allow for the casement window to open outwards. For more on all the different types of bug screen frames and how to determine which frame best suits your application, check back soon for our latest post as we go into this further or contact Screens Unlimited today at 602-888-4548!